Under the key word “digital”, the events in Forum C2 explore the question of how architecture will change through the use of digital tools and what options will be available through BIM. Using international examples recommendations are put forward on how BIM and digital tools can be used to best effect. Forum A4 will include a look at how analog processes can be combined successfully with digital-based methods. How can you guarantee planning and cost security? And: do digital processes improve transparency in planning? When combined with automated manufacturing procedures, digital planning also enables continuous process chains: from design to automated prefabrication in the factory through to the building site. This reduces error rates, shortens assembly times on site and improves the quality of building. This aspect of digitalization in construction will also be highlighted in Forum A4. With an acute shortage of accommodation and spiraling costs of construction in urban areas, the whole subject of residential construction is very much on the political agenda. The job of local authorities, housing companies, investors and planners is to increase the density of urban development in a sensible and careful way, and in part to come up with new models. New software and data-driven processes can support this because they are capable of uncovering new and untapped potential through the use of adaptive algorithms. Forum A4 examines future-oriented intelligent utilization concepts for the individual building, the urban district and the town. It´s about linking living and working, private and public areas, to provide a quality urban environment for all, with open spaces, despite a higher density of development. In the “Big Seven” cities of Berlin, Hamburg, Munich, Cologne, Frankfurt am Main, Stuttgart and Düsseldorf, the housing situation has become so acute that smaller towns, for example Augsburg, Freiburg and Münster, are now becoming more attractive and investment there is accelerating. Planners will have to respond to this. Forum C2 looks at unusual housing projects in these areas and the background to them. Comparisons are also drawn between projects in Germany and forward-looking solutions from Switzerland, Austria and Denmark. In Forum B0 one of the main focuses is on integrating old and new buildings in urban districts. Now that light and smart building have been given a dedicated section in Hall C2, these subjects are of course to be reflected in the forums program. Light is increasingly becoming an integral component in architecture and the planning process. A combination of daylight and artificial lighting is giving rise to inspiring and outstanding solutions in private and public buildings. 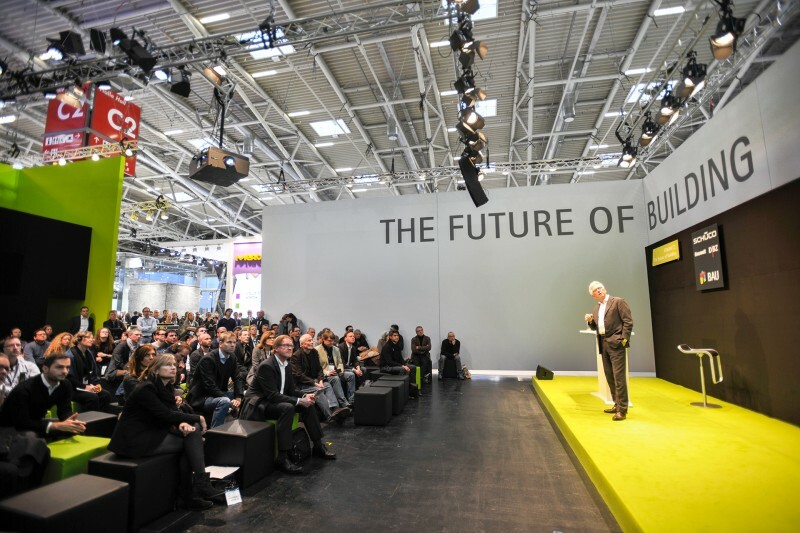 In Forum A4 architects, lighting planners and experts from industry will be exploring themes such as façade design and shading systems, interactive media facades, artificial light in the LED age, building management and smart building. Intelligent lighting technology linked with modern building automation is producing rooms with high thermal and visual comfort, attractive aesthetics and new energy-efficiency potential. Series or module-based construction is also making great advances. The industrialization of the building sector is continuing, prefabrication processes are once again accepted. The driving forces here are rapid population growth, migration and mobility, demographic and social change and not least increasing pressure of time and costs. Rapid assembly on site, plannability of costs and time, and certified quality and guarantees are making prefabrication in the factory increasingly interesting to planners. Efficiency does not, however, exclude individuality. From wall blocks to pre-installed wall modules and whole houses—there is a wide variety in series-produced (building) products. Examples presented in Forum A4 show that series production is more than mass production and that it should be understood as a process. That series construction is also an option in renovation and modernization work, is emphasized in the lectures in Forum B0.